Is the world eschewing Windows in favor of Linux? It's starting to look that way--we were pumped to read that astronauts on the International Space Station will be making the switch to laptops running Linux rather than Windows. Linux has an impressive track record in the scientific community: CERN’s Large Hadron Collider is controlled by Linux, and both NASA and SpaceX ground stations use Linux. Even DNA-sequencing lab technicians run Linux, which is no surprise when you consider the freedom and flexibility that a customizable open source operating system provides. Keith Chuvala, leader of the ISS's Laptops and Network Integration Teams, said, "We migrated key functions from Windows to Linux because we needed an operating system that was stable and reliable — one that would give us in-house control. So if we needed to patch, adjust, or adapt, we could." 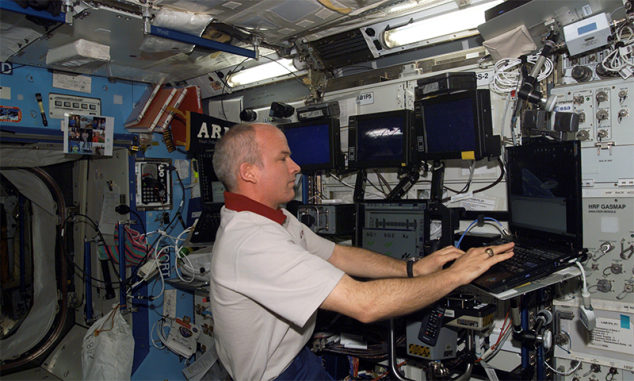 The astronauts will be running Debian 6, which is a well-tested and reliable distro. With the latest developments, Linux is poised to wrest even more market share from Windows in many areas, with one notable exception: diagramming. Professionals who need to create diagrams on a regular basis, including network diagrams (complete with standard shapes like AWS and Cisco icons), ER diagrams, UML diagrams, wireframes, mockups, and org charts, are often stuck using Microsoft Visio, which is inoperable outside of a Windows framework. Whether you're a scientist, a web developer, or a garden-variety geek, Lucidchart is an excellent Visio alternative for Linux. Perhaps the most compelling reason to use Lucidchart is its baked-in collaboration. Since we operate in the cloud, it only makes sense to allow deep, rich interactivity. You can use hot spots, links, layers, and demo mode. These features create dynamic action between objects, pages, and external links, and are particularly helpful for demonstrating how a live website or mobile app will respond to user interaction. Users may collaborate with anyone else, regardless of account status, and edits are saved and reflected instantly. This feature, while technically possible in Visio, requires access to SharePoint and a fair amount of technical wrangling. If you're looking for an affordable Visio alternative for Linux, do yourself a favor and sign up for a free 14-day Pro Trial. We don't require a credit card number, a download, or your first-born child. And let us know what you think! Feedback can be submitted in the comments section or to support@lucidchart.com.